The TableName field indicates the table on which the operation occurred (if applicable). The OldValues and NewValues fields contain the record data for record operations, and the Tables field contains the list of affected tables for transaction operations. The MirrorLog table contains all mirroring error messages, and the date/time when they occurred. The mirroring parameters are controlled via a special section in the dbsrvr.ini file. Paste the following section into your dbsrvr.ini and modify as necessary in order to properly set up and enabled the mirroring server. The Mirror Max Fail Retries determines how many times the DBISAM Database Server will attempt to retry a mirroring operation before it suspends mirroring. If mirroring is suspended, then stopping/starting the DBISAM Database Server will allow the mirroring to resume. However, if the error being experienced is fatal, such as a key violation, you will need to manually edit the MirrorData table and edit/remove the offending mirroring operations in order to allow the mirroring to successfully resume. If you have any questions or problems, just let me know. If everyone likes this, I can see about making it a more permanent part of DBISAM so that it shows up in the Server Administration Utility, etc. DBISAM 4.41 Build 2 is now available for download. If you're an existing customer, then you should be receiving an email shortly with download instructions. In addition, the DBISAM VCL products now include proper HTML help documentation for use with Embarcadero RAD Studio XE8. However, there is still a minor issue with the keywords that needs to be resolved, and currently the DBISAM documentation is not displayed on the Third Party Help menu in the IDE. Both of these issues will be resolved in the next build. Effective July 7, 2015, our subscription policy will be updated to include technical support on our product support forums. Our policy regarding support sessions and direct support via email, phone, or Skype will remain the same. Previously, our product support forums were primarily a source of peer support instead of technical support from us. Customers with current product subscriptions will continue to be allowed to post on our product support forums. Nothing will change for those with current product subscriptions. Those without a current subscription will not be allowed to post on our product support forums. However, they will still be able to read and search the content of the support forums. Please note that the subscription renewal policy applies to each product. If, for example, you own both a DBISAM and an ElevateDB license, but only your DBISAM subscription is current, you will not be able to post in the ElevateDB product support forums. If your subscription(s) is/are current, you will now be able to receive technical support from us on the product support forums. This support will be considered a second tier of support, below the direct support via email, phone, or Skype. The response time will normally be no more than 24 hours, as opposed to an immediate response for direct support. Also, based upon the nature of the issue we may ask that you use a support session, rather than the support forums. If your subscription(s) have lapsed, our subscription renewal policy remains in effect. If your subscription has been expired for two to four years, you will need to renew your license at 50% of the list price. If your subscription has been expired for more than 4 years (5 years from your last purchase or subscription renewal), you will need to purchase a new license at the full list price. As always, please contact me at sales@elevatesoft.com if you have any questions regarding this policy change. ElevateDB 2.19 Build 2 is now available for download. If you're an existing customer, then you should be receiving an email shortly with download instructions. This build contains bug fixes for several incident reports, which are detailed here. In addition, the ElevateDB VCL products now include proper HTML help documentation for use with Embarcadero RAD Studio XE8. However, there is still a minor issue with the keywords that needs to be resolved, and currently the ElevateDB documentation is not displayed on the Third Party Help menu in the IDE. Both of these issues will be resolved in the next build. We are very pleased to announce that Elevate Web Builder version 2 is now available for purchase and download. We would like to thank everyone that ordered the Elevate Web Builder 2 Preview for their invaluable feedback and incident reports. If you ordered the Elevate Web Builder 2 Preview, your order date was adjusted to June 22, 2015 and your subscription for Elevate Web Builder 2 that is included with the purchase will not expire until June 22, 2016. After this release, we are planning on spending a few weeks addressing any issues that may arise, and will be working on some smaller features that didn't make it into the final release. Any fixes and minor improvements will be released in new builds as they are completed. I'm happy to finally be able to share this really cool EWB 2 application with you. The application is called Cinedisk, and the author is Uli Becker. He originally developed the application using EWB 1, and it looked great even with a lot of the limitations that came with EWB 1 in terms of layout/design. However, the EWB 2 version is so cool that I asked him if we could host it directly on our web server. The application uses ElevateDB as the database engine. "Cinedisk is an application that manages your movie collection (later TV series will be added). It communicates with TheMovieDatabase (TMDb https://www.themoviedb.org) which provides an API to collect any information you are looking for. 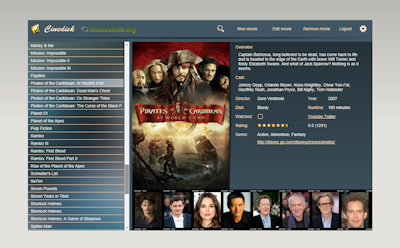 The basic information are stored in an EDB-Database, all images like the movie's poster or the cast images are loaded from TMDb server at runtime. Also additional information and images like "Biography" or "Best movies" in an actor's detail window are requested at runtime. TMDb uses JSON for all responses and that works nicely together with EWB. With EWB2 it's just fun to use TReader to parse the incoming JSON. To add a new movie to your collection, click the button and enter the title (or a part of it) of the movie you are looking for. Cinedisk sends a request to TMDb and displays the result with all matching movies. Just click on the poster of a movie to show all details in a separate window. Here you can edit most of the fields. Links for trailers are stored in form of a YouTube-ID. If a trailer is missing, you can google for it using the button at the bottom (the app only accepts YouTube trailers). Next to this button you find a hint how to do that. Once you have changed the ID, you can play the trailer immediately. To see additional information for actors, just click on their image to open a new window with biography and best movies (rated by the TMDb community). You can search for title, cast, content or a genre, to close the search result and return to the complete list of movies, just click on the matching icon. To avoid flickering and to compensate the timing difference between the loading times of text and images, the application uses two instances of an embedded "content" form. Only after the loading process has completed, the "new" content form is displayed. 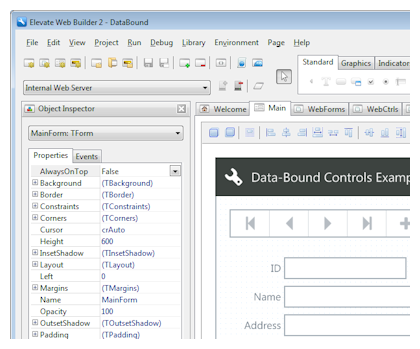 All layouts work with only a little of code - the new layout features of EWB2 were used to create a responsive layout. Thus resizing the browser window should keep a proper layout." Please be sure to let Uli know what you think in the comments.